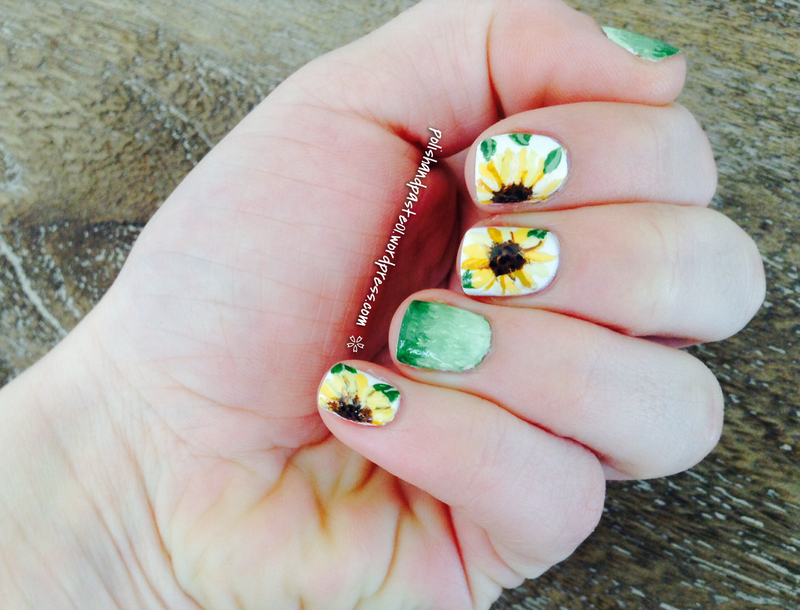 Polish and Paste | a nail art and craft blog. 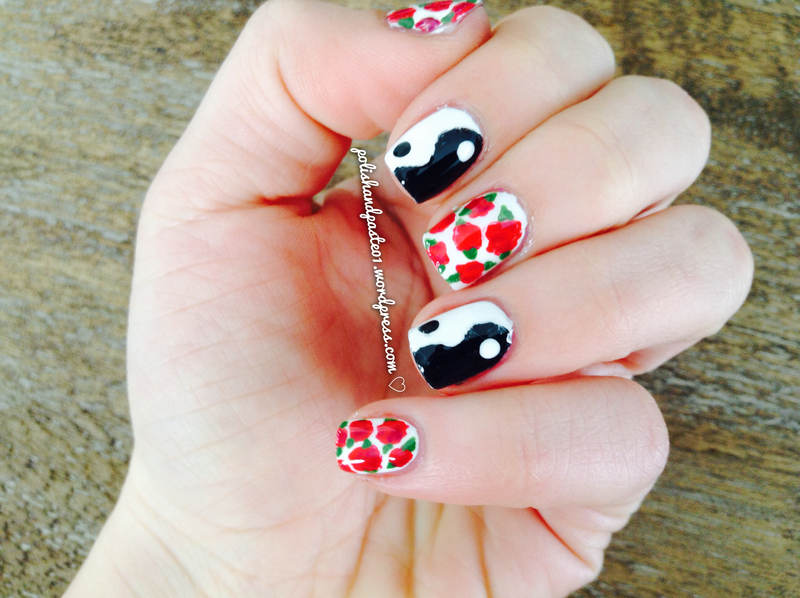 a nail art and craft blog. Ahhh! I haven’t posted in forever! I’m so sorry guys 🙂 Today I have a fun mani for summer to share! 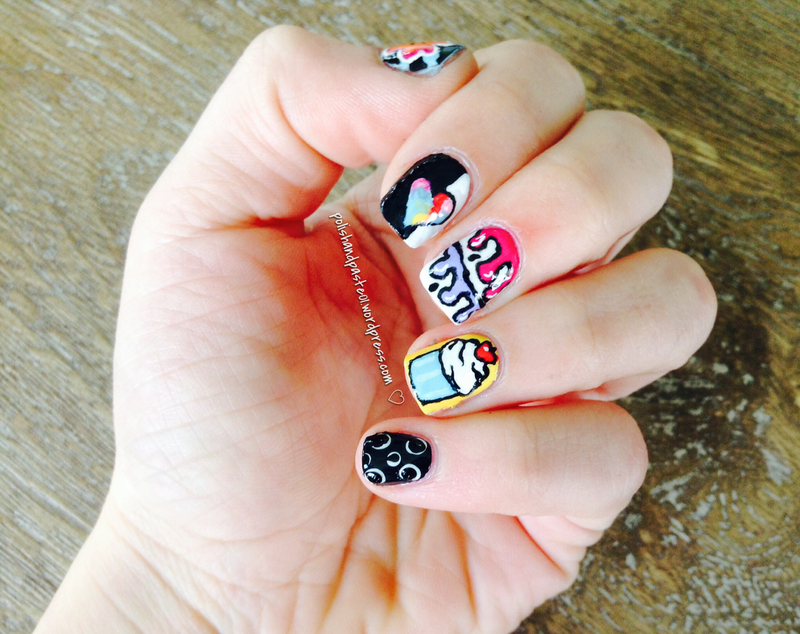 Most of these nails were inspired by Illustrated Nail. They have a cartoon look that I am really into at the moment. 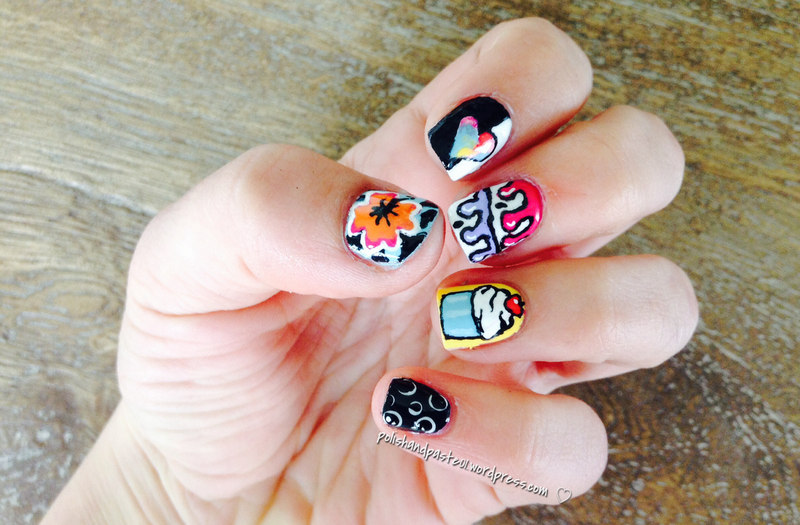 I think my favorite design is the cupcake… What’s yours? Happy April everyone! 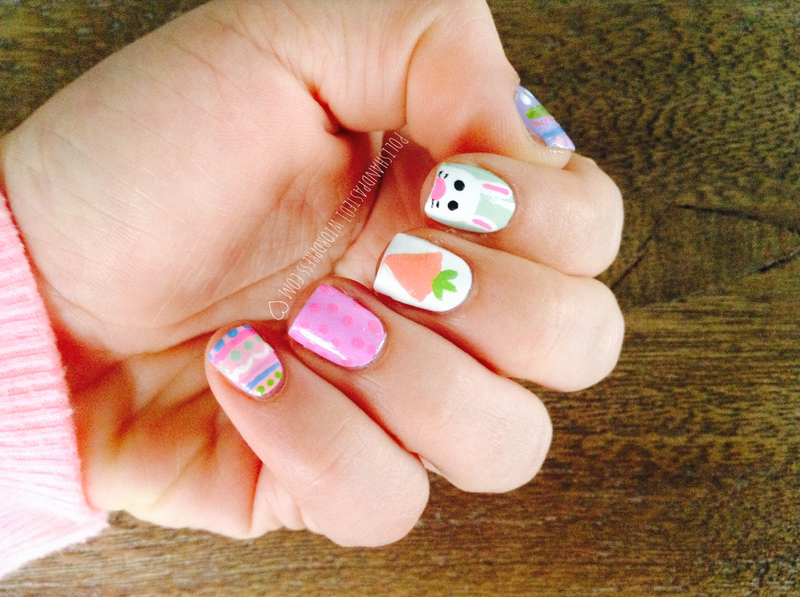 Although spring has officially sprung, it still doesn’t feel like it where I live – as I write this post it’s snowing 😦 To make it feel a little more like spring, I decided to do a bright and cheery Easter themed mani full of bright pastels and completed with a little bunny 🙂 I love the way it turned out! What do you guys think? Does it feel like spring where you live? Hello lovelies! 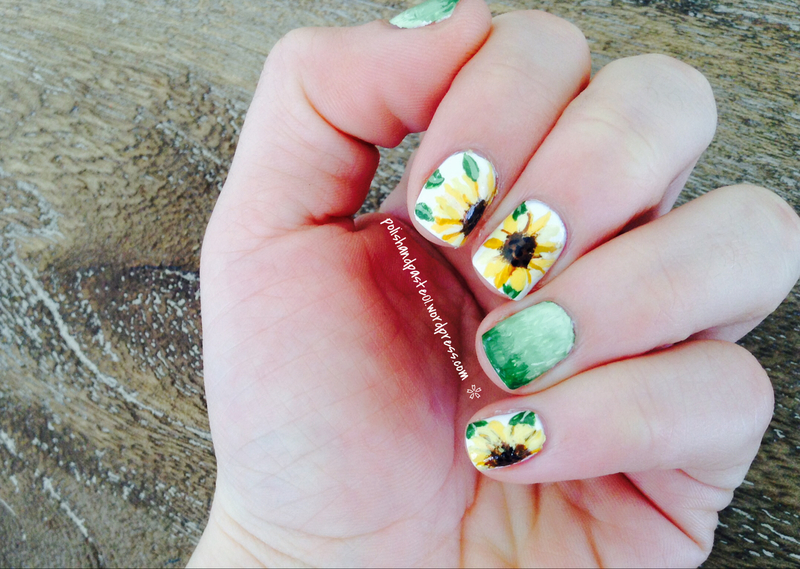 Today I have a springy design to share ^_^ I saw sunflower nails recently on Pinterest and it totally inspired me to try out the flowers! 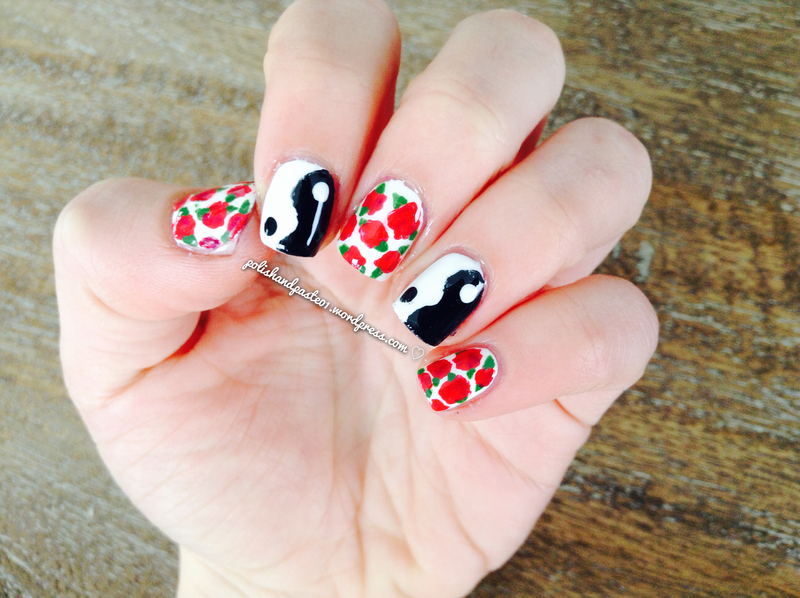 I usually only do roses on my nails, so this was a little different, and I have to say I’m really liking it! 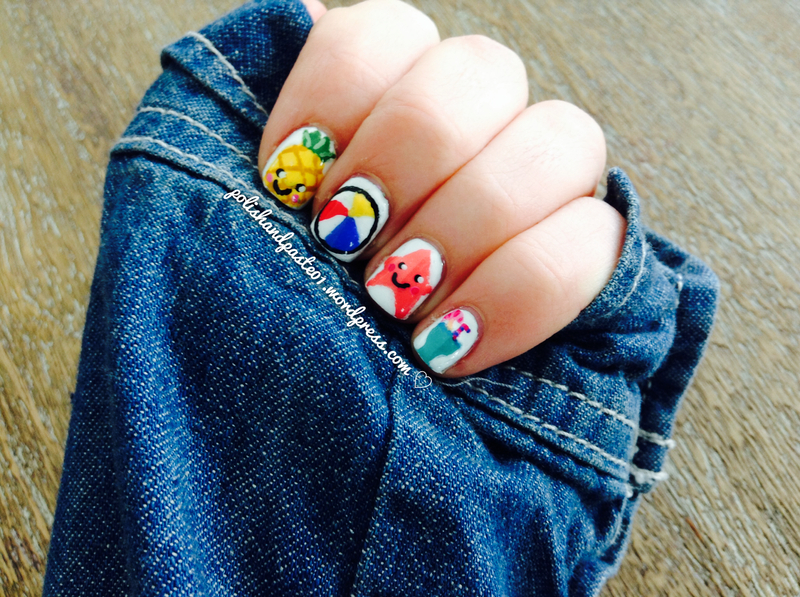 I went in more abstract direction with the design, and I also added a green ombre to my ring finger and thumb. What do you guys think? 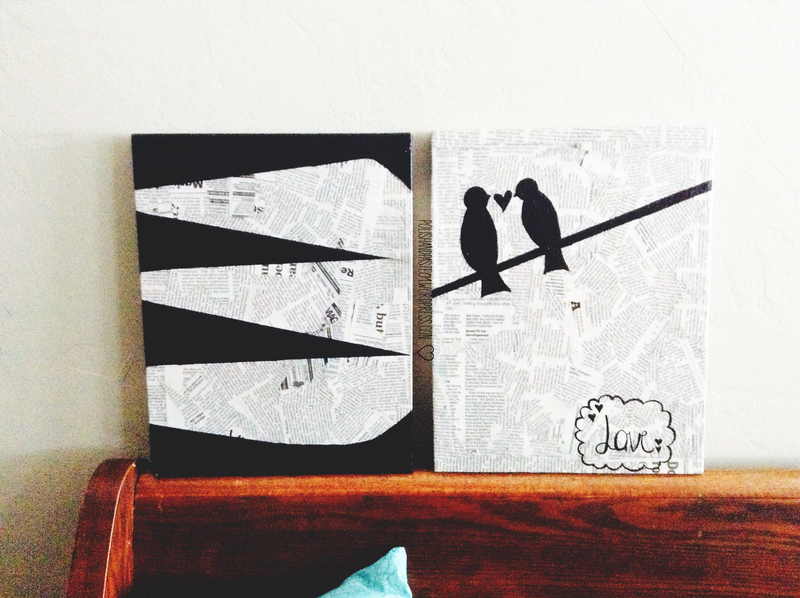 I got my inspiration for these paintings from Pinterest. The bird painting is my recreation of someone else’s painting, and the abstract one is my design 🙂 These were so easy! I used old used canvasses, newspaper, Mod Podge, and acrylic paint. Best thing? I spent no money! So this project is super duper easy! If you are out of wrapping paper, don’t worry! 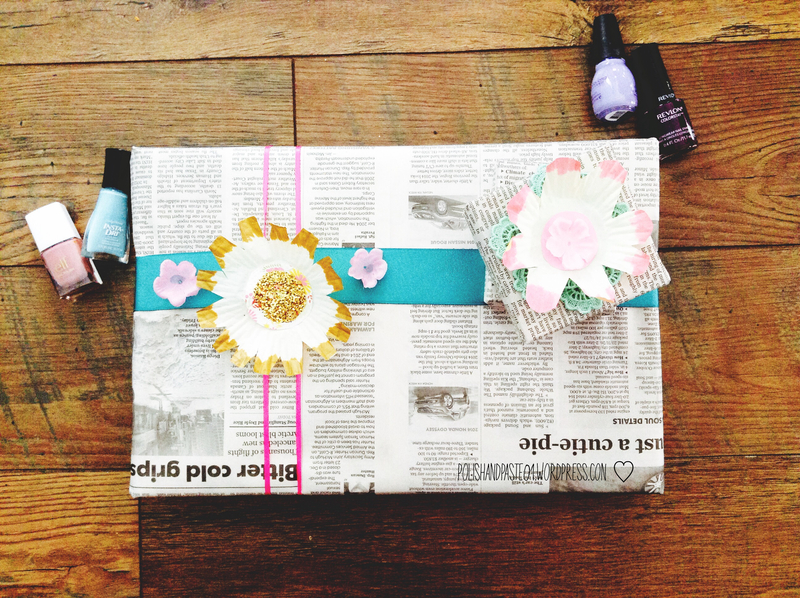 Just use today’s newspaper 🙂 I decorated these presents some ribbon I had around, along with some cupcake liner flowers I made. 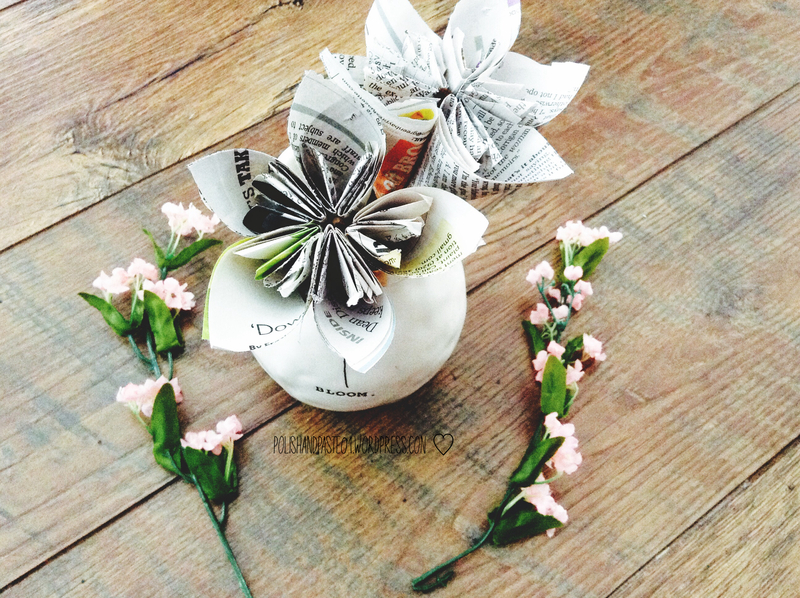 See how to make the flowers here: Cupcake Liner Flowers Pictorial. 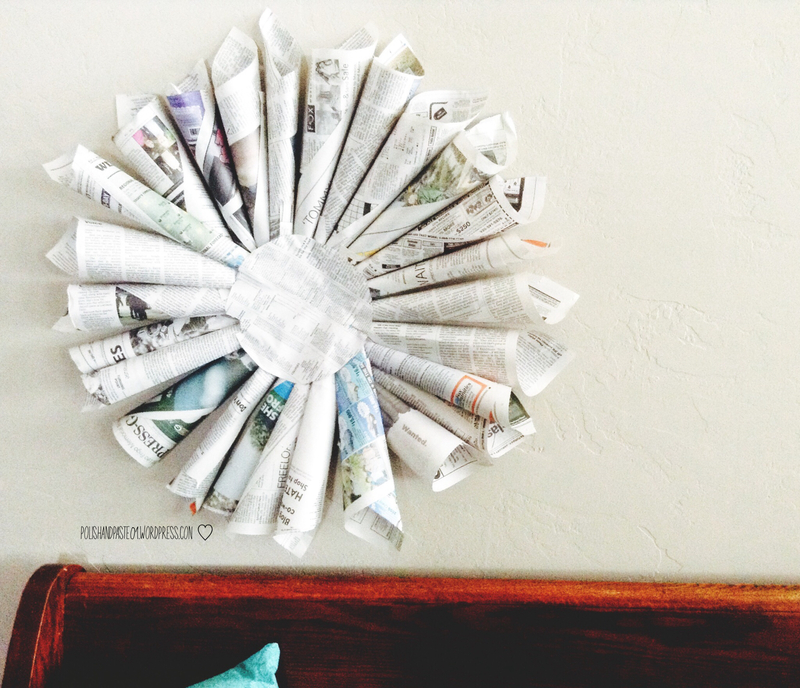 This wreath makes for a great wall decoration, and doesn’t take long to make. You can make it as big or small as you like, depending on how big of pieces of paper you use. I’ve made so many of these types of wreaths! Love them! These flowers are one of my favorite things to make! I can’t tell you how many I’ve made. I actually made a ton with white paper, glued them into a ball, and hung it from my ceiling. You can do so much with these flowers, and I highly recommend giving them a try! That’s all for now! I hope you enjoyed this post! 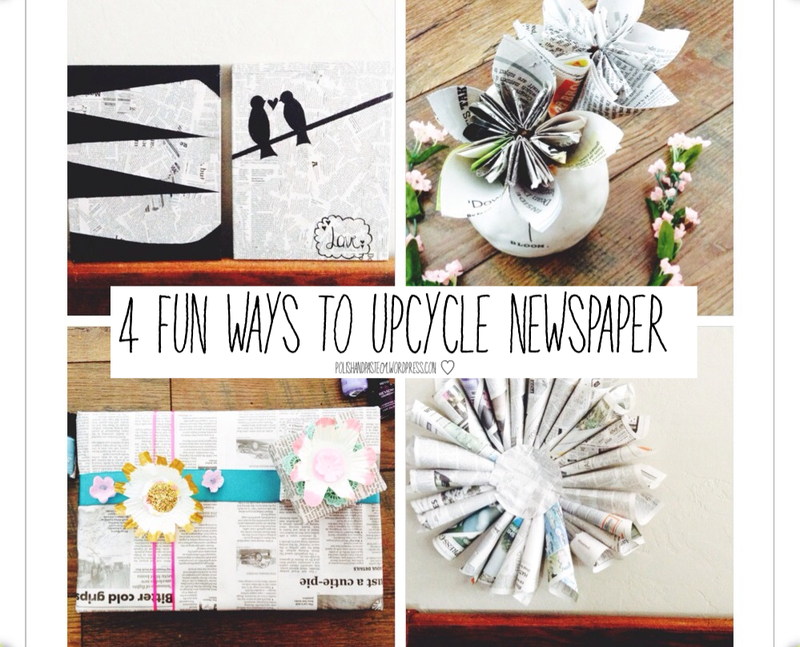 Will you be making anything with newspaper? Hey everyone! 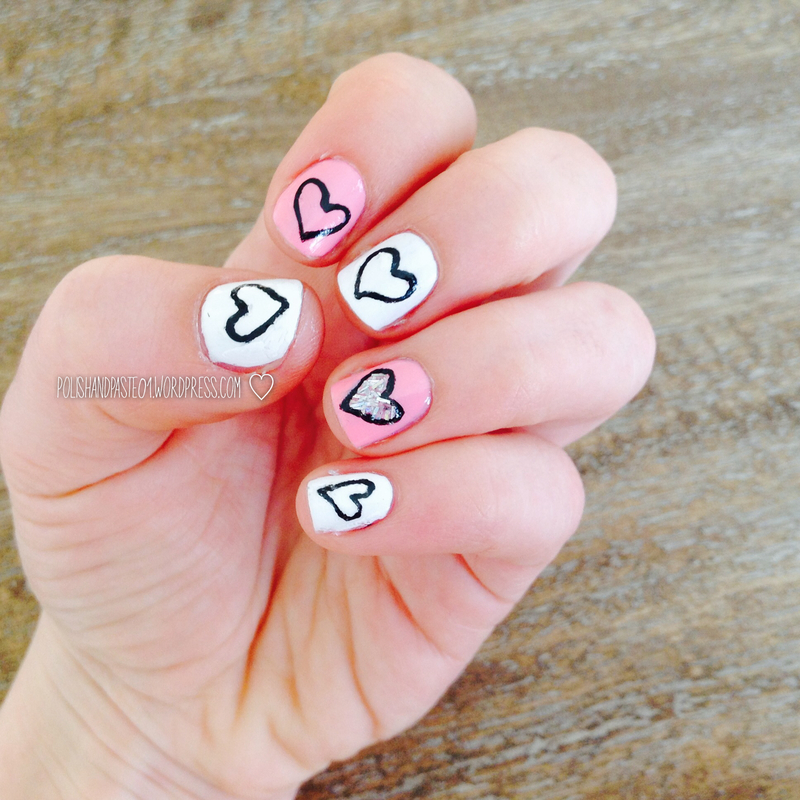 So I know everyone is probably posting a Valentine nail art design today, but I couldn’t resist 🙂 I decided to make this design pretty simple, but simple designs are my favorite actually! 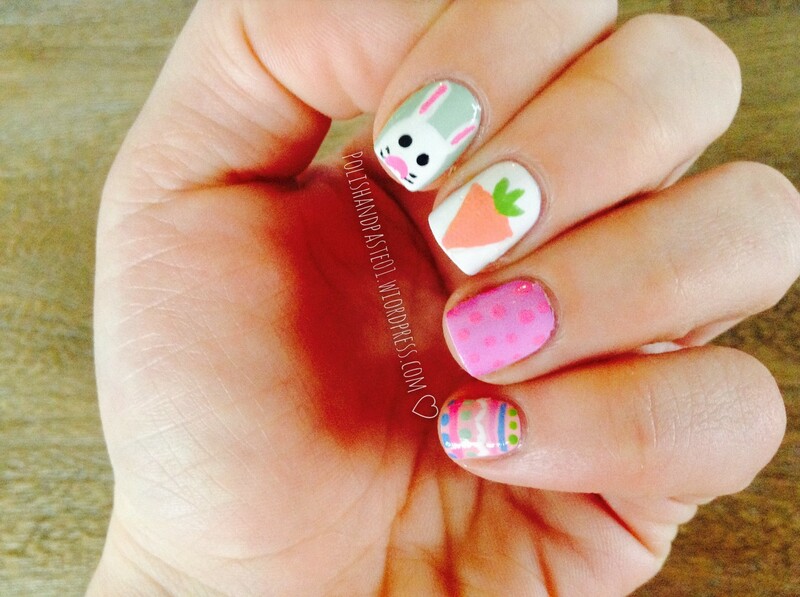 This was super quick and easy to do, and I added some glitter on my ring finger to add a little sparkle. What do you think about this design? What are you guys doing for Valentines? P.S. I’m going to be including a quote in all of my posts from now on. 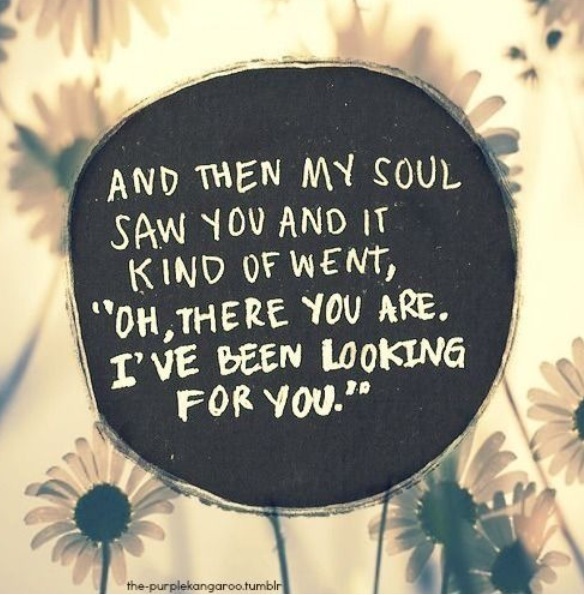 I love quotes, and I feel like they make the day happier 🙂 I thought this one was adorable! Hey guys! I apologize for the lack of posting lately! 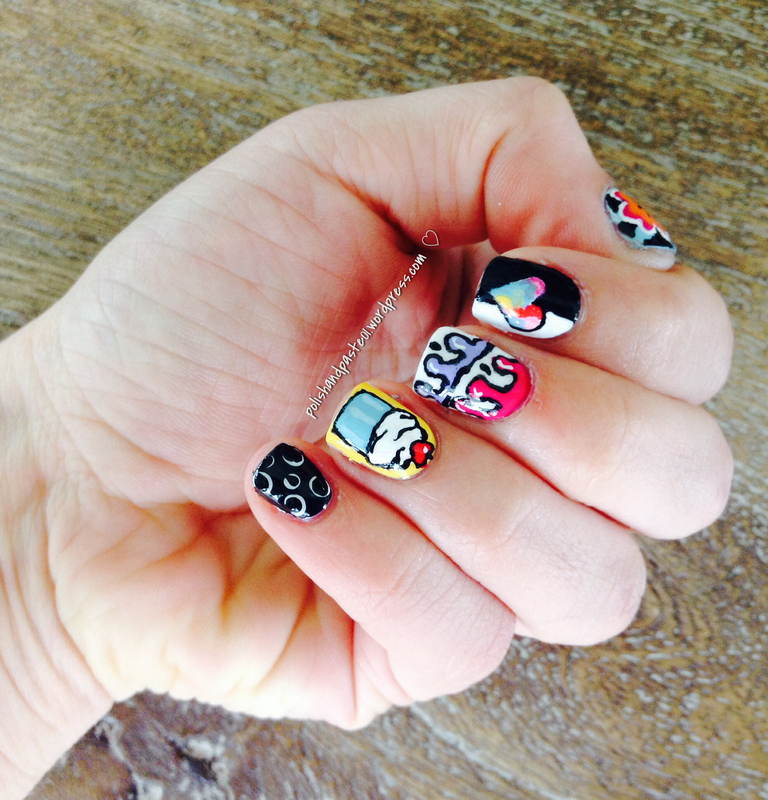 Things have been busy, and my nails totally broke (A nail art junkies worst nightmare, am I right?! ), so I have been allowing them to grow out again. But no worries, I will have a new nail art design up soon, and I also have a lot of fun crafting ideas 🙂 Chloinmind tagged me to do the “Get To Know Me Tag” awhile ago (thanks so much for tagging me! ), and I think it is such a fun tag! While my nails are on the mend I thought I would do it today. Be sure to check out Chloinmind, it’s an amazing blog! Is your hair naturally curly or straight? My hair is mostly straight, but it has a lot of body, and tends to be wavy at times. Do you wear the same style every day, or do you change it? I change it day to day, but I don’t do anything fancy. I switch between a bun, a high ponytail, straight, and natural (on those lazy days!). How long does it take for you to put on makeup? I would say 30 to 45 minutes. It can definitely take me much longer if I don’t have to be anywhere! What do you do first? Face or eyes? Most of the time face, but every so often I will do my eyes first. I’m just weird like that I guess! Do you collect makeup or just buy what you need when you need it? Hmmm… I am not a huge collector, but I do end up buying makeup when I don’t need it. So yes, I guess I collect, but a lot. Does that make any sense? Hehehe. How often do you wear false eyelashes? Do you do a full face of makeup every day? Yes, but I don’t wear heavy makeup. Do you wear makeup when you’re home alone or with family? How many high-end products do you have? How often do you change your handbag? Not very often, I tend to stick with the same bag for awhile! 4’9”! I’m super short. 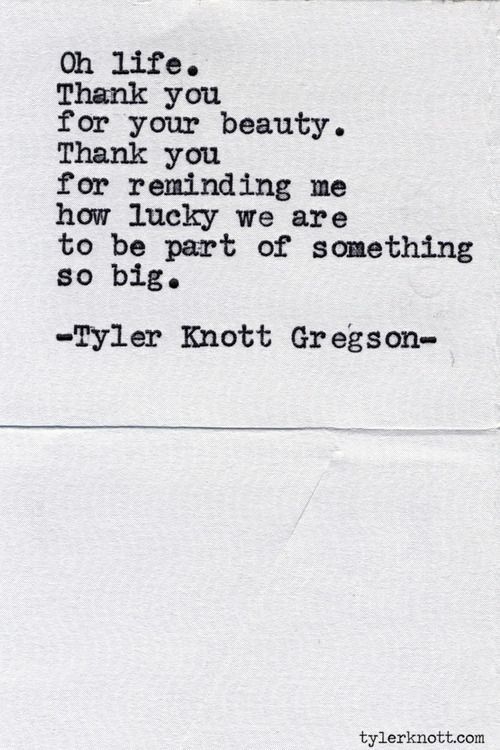 Good things come is small packages though, right?? One dog name Bruno. He’s a Boston Terrier! I don’t really have a system actually! I wish I was one of those people who are super organized when it comes to blogging, but alas I’m not! Do you read comments posted on blogs? Yes! I love hearing what people have to say and it’s a great way to find new blogs! I was trying to think of a name that combined crafting with nail art. My mom actually came up with the name! You use polish when doing nail art, and paste when doing crafts. Ta da! Polish and Paste was born! What kind of camera do you use for your photographs? I use a 5th generation iPod touch. The camera quality is amazing! Hey guys! 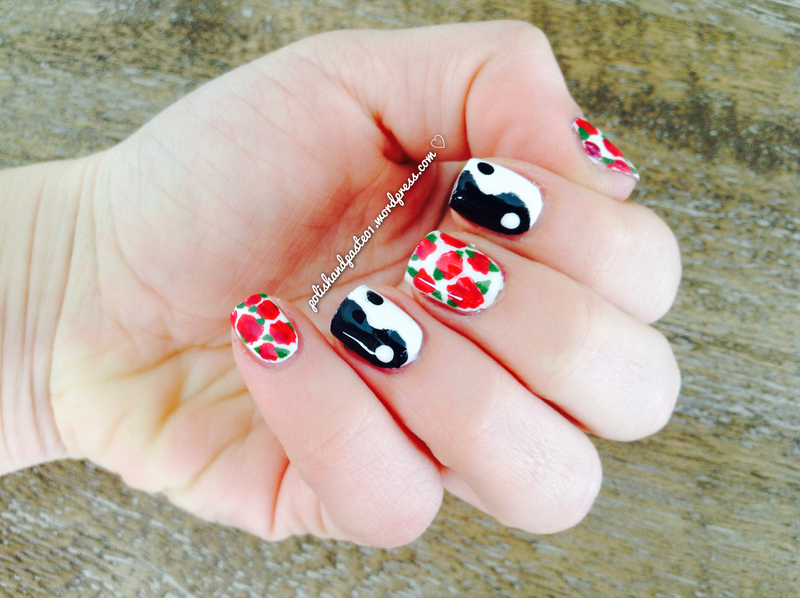 I love the yin and yang symbol, and I have always loved the way it looks on nails! I decided to paint it along with some red roses for this design 🙂 I like the way it turned out! What do you think? Hey guys! 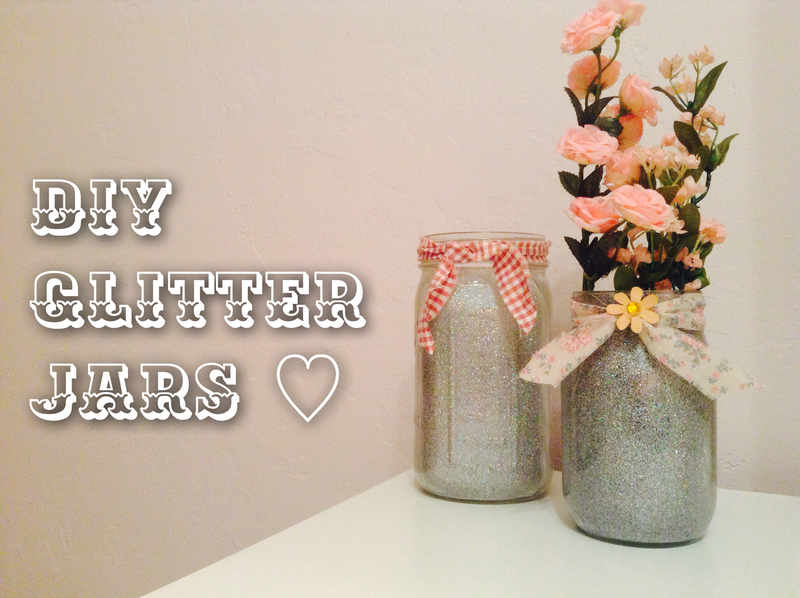 Today’s post is going to be a pictorial on how to make these super easy glitter jars! The pictures are not doing these justice – they are so super glittery and look so cute! It’s a great way to re-use all of those jars from food that you might throw away otherwise. You could also stick a fake battery operated candle (only use a fake candle) inside one of these for a really pretty candle. I tired it and it works great 🙂 I got this from a DIY video that Bethany Mota uploaded around Valentines Day last year. Without further ado, lets get on with the simple tutorial! Step 1. Gather your supplies. 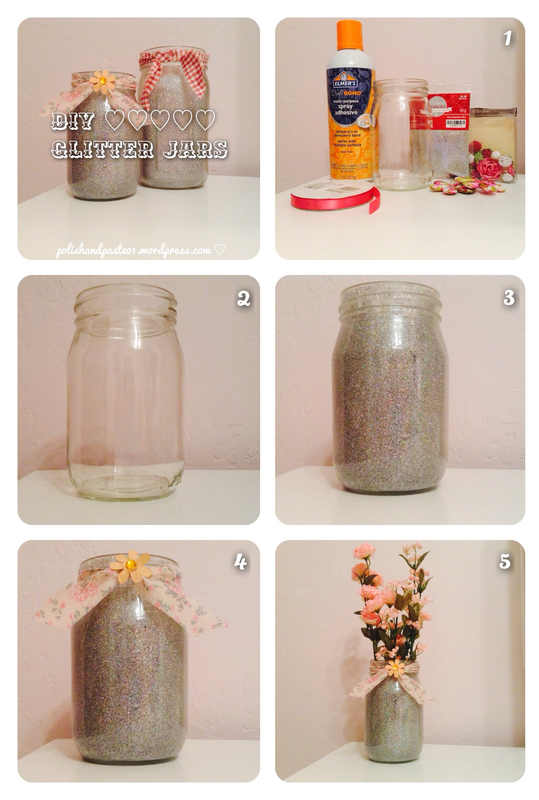 You will need a clean, label-free jar, spray adhesive, glitter of your choice, and random stuff to decorate the jar with. Some ideas are ribbon, jewels, stickers, etc. I used fabric for my ribbon! Step 2. Take your jar and clean it off, making sure there is no residue left on it from a label. Step 3. Take your spray adhesive and lightly spray the inside of the jar – make sure the whole inside is covered with adhesive so glitter will stick everywhere. Poor a reasonable amount of glitter in the jar and put the cover on it. Shake the glitter around until you see the whole inside is covered and sparkly 🙂 Take off the cover and tap the jar upside down on some paper so the excess glitter is removed. Step 4. Cut some ribbon or fabric and tie it around the jar. You can decorate it however you want. It’s up to you! Step 5. Stick what you want in it – I used fake flowers, as you wouldn’t want to use real flowers – putting water in the jar would ruin it. Hey guys! 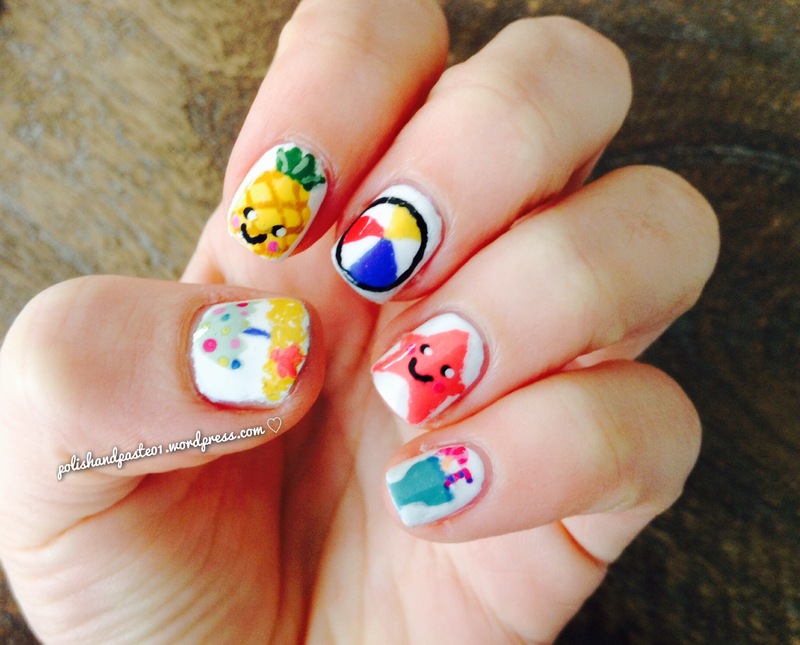 Where I live it’s snowy and freezing, so I thought I would do a summer nail design to make me feel a little more summery! 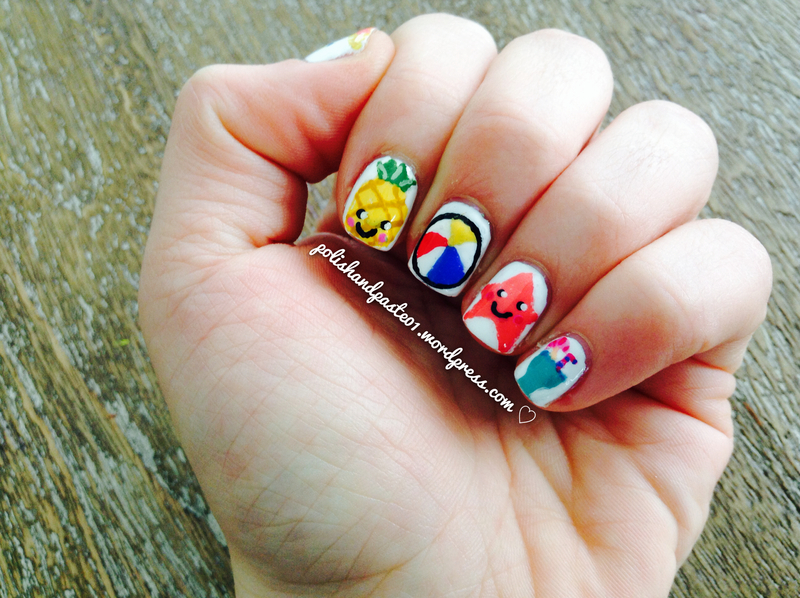 This might be one of my favorite designs that I’ve done 🙂 I had to add a cute face to the pineapple and starfish because I feel like the cuter the nail art the better! 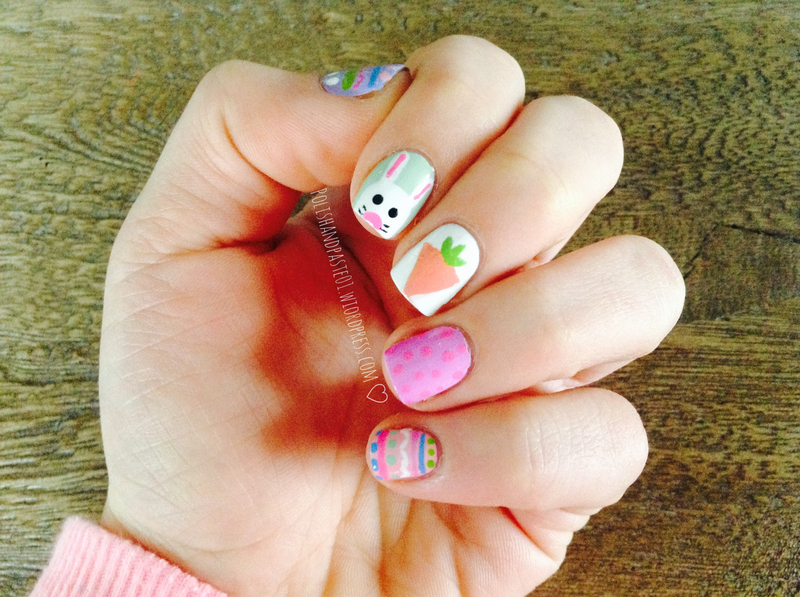 What’s your favorite nail? 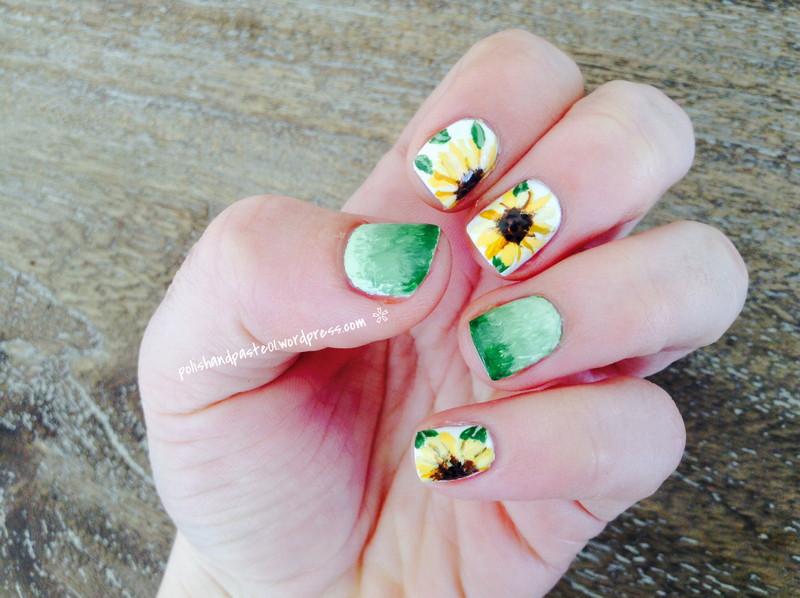 I hope this manicure gives you a little bit of summer if it’s freezing where you live! Hey everyone! 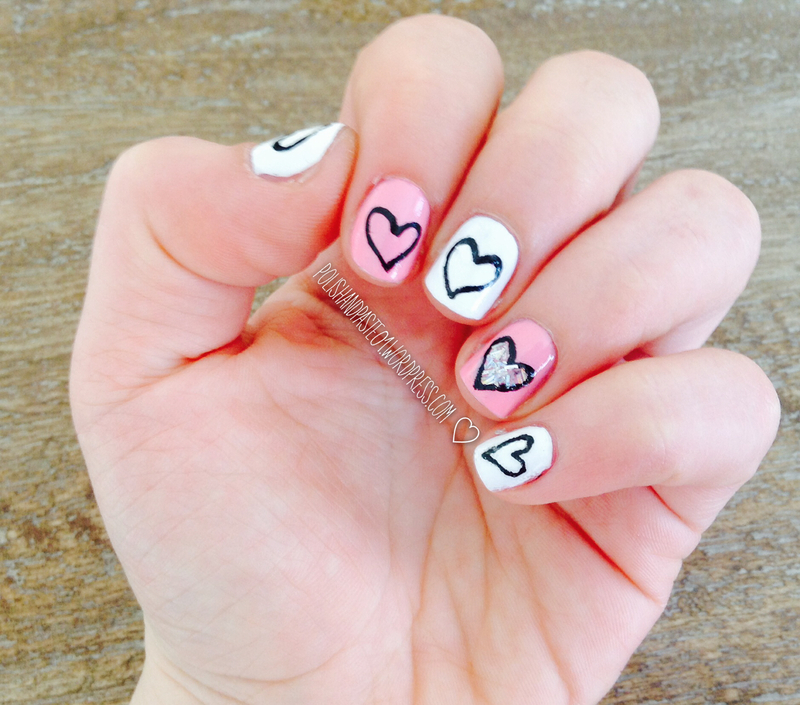 Valentines Day will be here before you know it, so it’s time to get some nail art ideas! 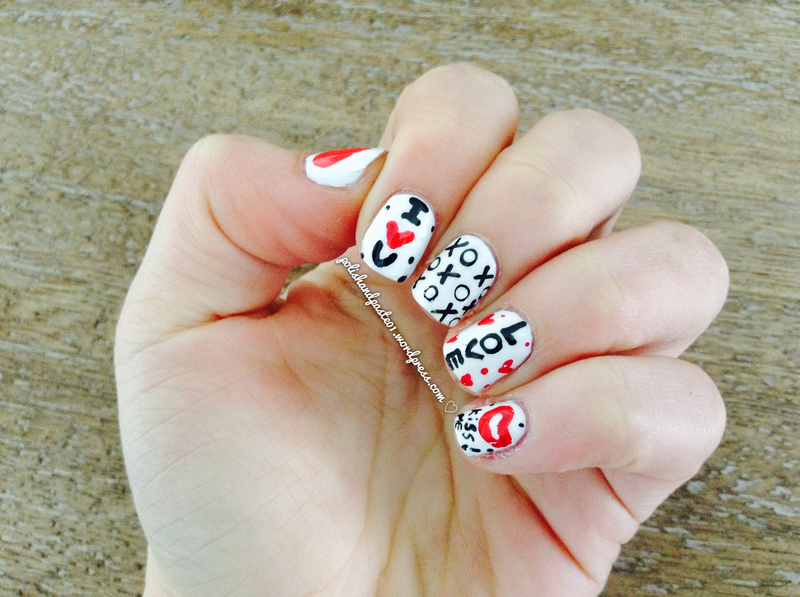 For a nail art lover like me, any holiday is an excuse to do nail art… so here I am with a Valentines design! 🙂 I decided to go for a black, white, and red color combo instead of the usual red and pink. What do you guys think of this design? 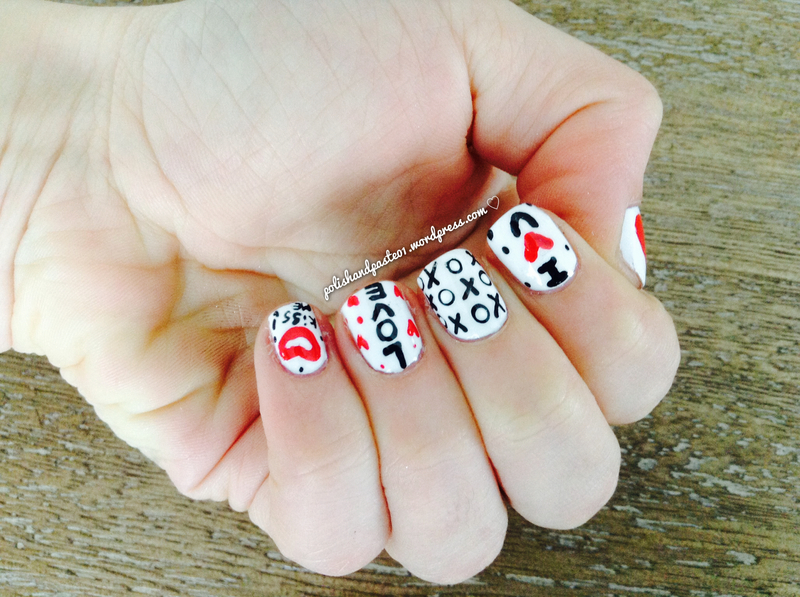 Do you like doing nail art for Valentines Day?